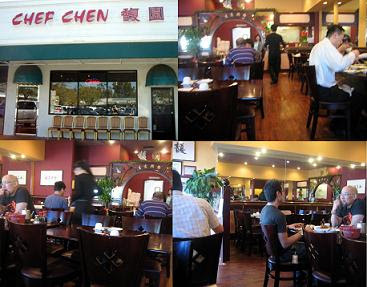 We haven't been back to Chef Chen in a while because the quality of their food has been going down a lot. It's still acceptable enough to come back once in a while since the price for lunch is cheap. They are a pretty new addition to the restaurant choices in Irvine off of Jefferey. It's nice and clean with a mahogany furnished interior. I have been there so many times that all the servers know who my Mom and I are. Some of them are really nice and some are just decent, depends on your luck. The lunches come with Hot & Sour Soup and salad, but we never get the salad. I don't like the plum dressing, so they know not to give us the salad. My favorite dish was the Black Bean Fish Fillet. It used to be so good, but keeps getting worse and worse. Normally I order it and then add another order after it comes out, that way to guarantee they are prepared individually. I think they have gotten lazy and don't batter and fry the fish fillets anymore before stir frying. The flavor varies from day to day and even the same day, they really need to work on consistency. We usually get the Shanghai Spare Ribs, which is usually good. It's a sweet soy-based sauce that is thickened onto chopped spare ribs. The ribs are crispy and tasty. Some times there's a little too much sauce, but the meat is consistently good. It's very similar to sesame chicken, except with pork ribs. They have a salt & pepper ribs, but that isn't the same cut of ribs. The Shanghai ribs are actual real tiny diced ribs versus the salt & pepper are like pork chop cuts. All in all the food is decent, they are really a hit and miss a lot of the times. They are pretty popular since they are one of the new places that opened up. Their lunch varies from $5-$7. I have only been here once for dinner and it's definitely not worth paying full price. Try to catch this place for lunch, they have lunch every day of the week. Got to love Asian places and being open all the time!